I went through my cupboards and did another clean up of things that I just don't need anymore. 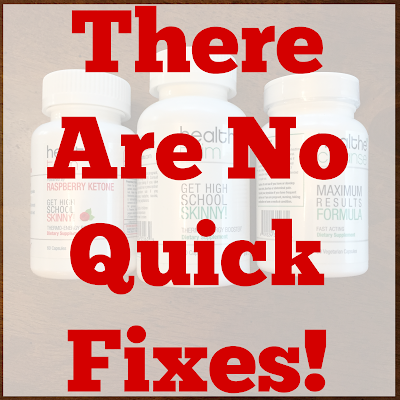 I did this about 6 months ago and finally threw out some of my "quick fix" pills that I thought would work at the time. (Garcinia Cambogia and the green coffee bean extracts pills) And guess what? I found 3 more bottles of these pills that are meant to help get me "high school skinny!" Why do I still have these? Honestly, in case I got desperate. (after pregnancy of course) But not anymore. They are gone. In the trash! No more wasting my money on pills that won't work and sticking with what I finally know works! I was that girl that was always looking for the easy way to lose weight. The magic pill to help me so I wouldn't have to work as hard. But guess what? There is not magic pill! Nope, never. You have to learn to eat right and fill your body with the nutrients and vitamins that your body needs, and that is why I never lost the weight while taking those "magic pills." I would still eat crap thinking that my pills would take care of it for me. They didn't. Stop taking the easy pills, eat good whole foods and a healthy diet. That is the first place to start, every single time. If you don't know what foods to eat, or even where to start, please EMAIL ME, let's talk. THIS IS WHAT I DO AND LOVE DOING! Coach, motivate, inspire. Together we can get you on the right path so that you never have to take those pills again, or even want to, and still be able to eat and keep the weight off! You are worth it to finally be in control of your life!